MUSIKMESSE 2015: Audio Technica has unveiled its new AT2020 USBi microphone, which adds iOS compatibility to the AT2020 USB design. It's broadly the same microphone, offering USB connectivity, 24-bit/96 kHz sampling and a 20-20,000 Hz frequency response, but now it can also be used with iOS devices, alongside Macs and PCs, and comes packaged with an included Lightning cable, as well as the original USB connector. 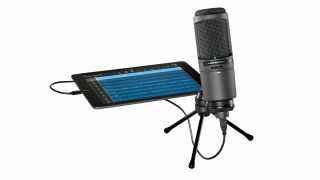 Prolight+Sound sees the European unveiling of Audio-Technica's new AT2020USBi cardioid condenser USB microphone featuring iOS compatibility. Combining high-resolution audio with increased connectivity options, the AT2020USBi adds a new level of sound-quality and convenience to Audio-Technica's USB microphone line. Modelled after the critically acclaimed AT2020, this digital output mic features an A/D converter with a 24-bit/96 kHz sampling rate to deliver high-resolution articulation and intelligibility that's perfect for home studio recording, field recording, podcasting and voiceover use. The AT2020USBi works with both USB and Lightning cables (included), so users can employ it straight from the box to digitally capture audio on the device of their choice: PC, Mac or iOS. The integrated gain control adds to the convenience, allowing users to adjust the input level directly on the microphone.